Delete your Outlook Duplicates in seconds. All Outlook Items are supported. You have each Outlook contact suddenly twice after a synchronization with your handheld? Or you wanted to download your emails and Outlook loaded all the emails you already have again? Whenever you have the same content twice or more times in your Outlook then you need a tool to remove Outlook duplicates. 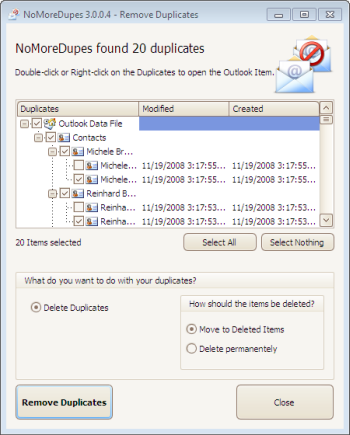 ‘NoMoreDupes for Outlook’ is able to remove all your Outlook duplicates. You don’t need to buy separate tools. If you want you can merge duplicated Outlook contacts to one contact. This software removes doubled Outlook Contacts, Emails, Appointments, Notes, Tasks and Journal entries. ‘NoMoreDupes for Outlook’ is an Outlook add-in to remove Outlook duplicates. Not only contacts or emails are supported. All items of Outlook are supported by this Outlook duplicate remover. You can even search across folders. Perhaps you have the same contact in different folders? Search for it – find it – delete it. Automatically. Get rid of your doublets in seconds even if you have a big Outlook data file. Customize the way how NoMoreDupes recognizes duplicates in your Outlook. Should NoMoreDupes look only at first name or last name or additionally on the company name? You set the criteria and NoMoreDupes will find your Outlook duplicates within the blink of an eye. Every Outlook Item is supported in one single product. You don’t need to buy several add-ins to delete all of your Outlook duplicates. See the result of the deletion process in a preview with the information of the location and the last modification date. Duplicated Outlook items in different folders will be found, too. You can open corresponded items with one click to see the differences or to delete the duplicate manually. Move optionally Outlook duplicates to a specific folder. Merge duplicated Outlook contacts to one contact. “NoMoreDupes” runs on Windows 10, Windows 8, Windows 7, Windows Vista and Windows XP with Outlook 2000, Outlook 2002 (XP), Outlook 2003, Outlook 2007, Outlook 2010, Outlook 2013 and Outlook 2016 (32bit and 64bit). Thanks for a handy utility. NoMoreDupes is the second or third such utility I've purchased, and yours is the best I've found. The user interface is very rationally thought out, and it actually works. You can't say that about every email duplicate scrubber out there. Your prices are very reasonable - I just bought my second license, and happy to do so. I'd like you to know that your product is great. I use it all the time. Many thanks for your help and your prompt reply. We move a lot of emails to archive subfolders within Outlook and that often causes duplicates. NoMoreDupes has been really helpful in cleaning up these folders. Checked 4 outlook pst archives (cross folders) in less than 5 minutes and found more than 2,000 duplicates. Impressive, specially because I used other dupe checkers in the past. Your program found more duplicates out of the box (no configuration change needed). NoMoreDupes is wonderful for clearing the debris from using HotSync between my palm device and Tablet PC. Copyright 2017 — Wisco. All rights reserved. Outlook is a trademark of Microsoft.